Range Tropical rainforests of West Africa. Diet Babies eat pinhead crickets, and other small insects. Adults eat crickets, mealworms, other large insects, and an occasional pinkie mouse. Full Grown Size 4.5 to 6 inches. Temperature 75 to 82° F.
Humidity 75 to 80%. Adults may drink from a shallow, wide water dish. Housing Babies can live in a clear plastic deli-container with air holes. 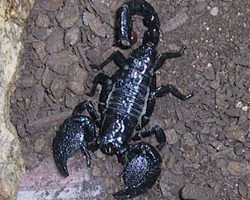 Adults can live in a 5 to 20-gallon tank depending on the number of scorpions. Floor space is more important than height. Substrate 3 to 4 inches of peat moss or potting soil. Decor Rocks, logs, cork bark, etc. make good hiding places. Moss can be added for floor cover, but leave some areas open for burrowing in the substrate.